WNYC’s Radiolab has garnered plenty of acclaim since its first shows went on the air back in 2002, and now thousands of fans (including myself) tend to champ at the bit in anticipation of hearing Jad Abumrad and Robert Krulwich geek out on some new topic. Radiolab co-host Abumrad told me recently that a majority of Radiolab listeners get their fix from podcasts, and in an effort to put their own stamp on the mobile Radiolab experience, WNYC has just released the official Radiolab app for iOS and Android . The app, it must be said, is terribly handsome. Users are plopped down at a desk and as they begin to swipe down, they break through a nearby window and begin to traverse the Radiolab world. The trip is one that takes time to fully scroll through, though a handy indicator nestled along the right side of the screen keeps track of your progress. 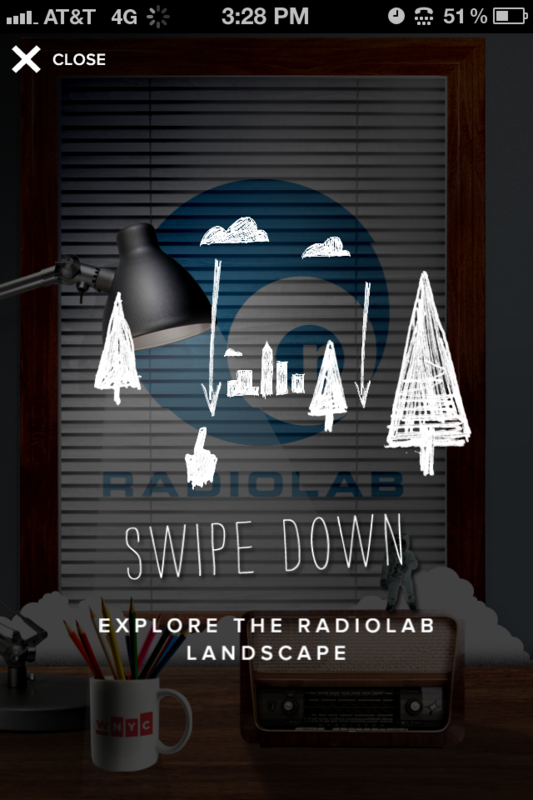 Continuing to swipe through the app will eventually lead users to its different sections — an area where they can listen to (and download) every Radiolab show and short, a section that aggregates news from the Radiolab website, and perhaps most intriguingly, the “Make” section. From here, users get can involved with the show by responding to requests put out by the Radiolab crew. Some of the live requests are recurring necessities — the show’s guests and participants are often asked to record the show’s credits and now users can pitch in with their own rendition — but the potential exists to do much more. In recent months, the show’s staff has reached out to listeners to provide their own input on topics like whether or not tic-tac-toe is a universal game and what the general walking speed is like in different cities across the globe. They’ve also launched a Remix project in which they’ve made their audio assets and tracks available to listeners to mess with, in hopes that their content combined with user imagination and ingenuity will lead yield some interesting results. It’s not a stretch to imagine that the Radiolab team will eventually come to use the Make section as a way to crowdsource unique information and perspectives from their users. 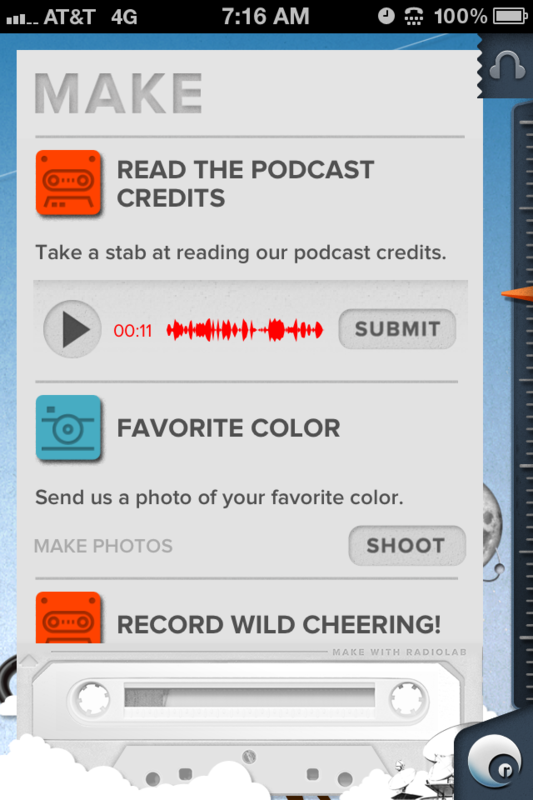 Abumrad admits that right now, the Make section is sort of limited in scope; aside from recording the credits, users can also upload pictures of their favorite colors and submit audio of wild cheering. All of the uploaded sound recordings are pushed to Radiolab’s SoundCloud account, and if users are feeling particularly brave, they can share their recordings on their own SoundCloud accounts to boot. Long-time listeners can attest that Radiolab has an aural character all its own, and the process of translating the show’s sense of scientific whimsy and wonder into a visual experience was nothing to sneeze at. As such, the app is packed with in-jokes and Easter eggs for the true fanboy to search for, so Radiolab devotees will have plenty of minutiae to search out once they’ve gotten their fill of Jad and Robert’s voices. And of course, as an app for a public radio show, they had to include a way for users to financially support the show — in this case, people can donate from the so-called “Pledge Cow.” For those that would rather skip all the visual flair and head straight for the content, a shortcut button sits in the bottom right corner that allows people to jump directly from section to section. “We spent months trying to craft an experience in the spirit of the show,” said Tom Hjelm, New York Public Radio’s Chief Digital Officer. 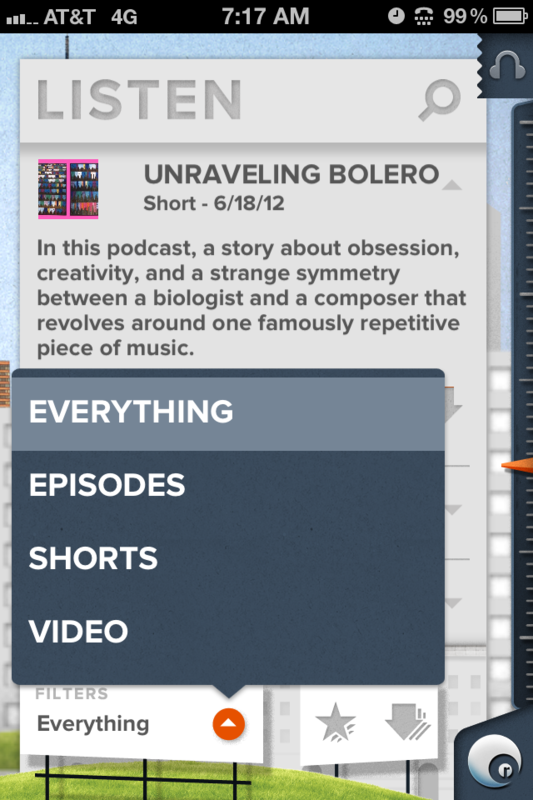 “We’ve tried to make it as easy as possible to find stuff, but also to create this coherent journey with its own incidental pleasures.” He’s not kidding — Radiolab first started soliciting ideas and suggestions for what to implement in a mobile app over a year ago, though the finished product certainly seems to have benefited from all that effort. 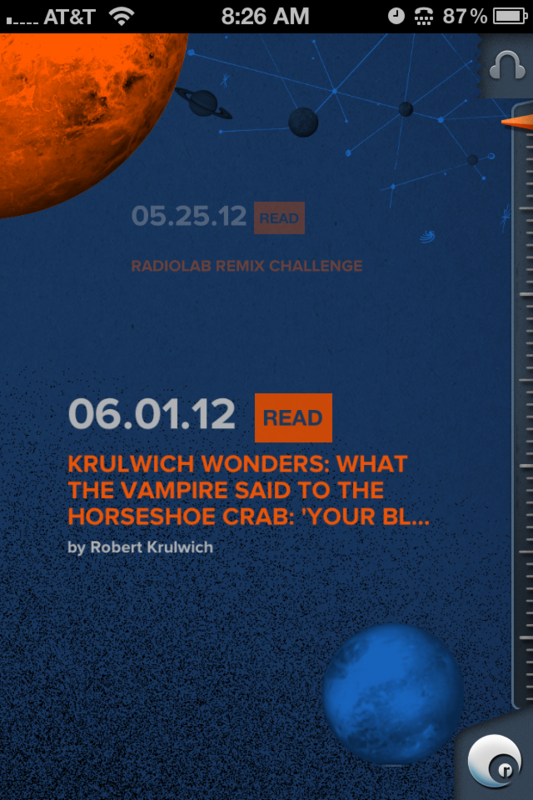 The Radiolab app is now live in the iOS App Store and the Google Play Store for $2.99.